1. Transport of radionuclides according to Dutch regulations. Output of data necessary for transport documents. 2. Application of radionuclides and devices emitting radiation (e.g. X-ray devices) in institutes (e.g. hospitals). Institutional permissions for usage. 3. Laboratory load factors and environmental implications of the application of radionuclides and radiating devices, using tables of Dose Coefficients for inhalation and ingestion. Radioactive waste disposal in water and air; radiation levels at institutional boundaries. Wall transmission factors directly from open source thickness- and material-data (using energy, buildup- and mu/rho-data) and X-ray transmission data. Warning system for maintenance and status changes. 4. Nuclide data and Transmission data (using published data for emissions, contamination (internal/external) and transport): Emissions (energies, yields), Mass attenuation coefficients mu/rho for >120 materials, Wall transmissions with buildup, Lung clearance, Dose coefficients e(50), IAEA Safety values, Ambient Doses H*(10), H(skin), Transport coefficients and transport data for parcels. 5. Radiological badges of employees; overall bookkeeping system with statistical applications (individuals over years and groups, locations over individuals and years). Automated input from badge measurement files, and automated check with local personal data files, using matching algorithms (e.g. Johnson vs. Jonson). Extensive output in table form and graphic figures. 6. Lasers Damage levels and safety distances for the eye and the skin, using iterative calculations according to the European Guidelines. The program is a full administrative system, providing data needed for Institutional Reports and Nuclear Law Dossiers (NL: KEW-dossiers). It contains tables for all necessary data, like atomic spectra, densities, attenuation coefficients, dose coefficients, disposal requirements etc. It runs on your local computer, without online connections, so less danger for hacking or data theft. The package was originally developed by the author (see main page) for use in his Institute. It is now made available for free to the (former) colleagues. The underlying data used are taken from open sources or are made available on a personal basis. The A-program is partly in Dutch, the B-applications are in English. 4. Read file READ ME FIRST.txt. 6. Run HYGIRAD-Xnn.exe by double-click. NB. *.GEG-files are program data, *.INP and *.INB-files are meant for your data input. See HELP in the program. The download also includes a preliminary APK-file (TransApp-debug.apk), meant to download the APP (see B-b. above) on an Android mobile device. See internet for download instructions of APK-files. This program package is free to use. We spent a lot of time and effort in developing it. Therefore, we would appreciate if you could spend a small amount to help cover our expenses. NL30INGB0000002875 (F.F.M. de Mul, Almelo, the Netherlands), bank BIC.no. : INGBNL2A (ING-bank). If you wish, and we got your address, we will send you a receipt (or pro-forma invoice). Please send us your address, so that we can inform you directly about updates. In case you feel a bit reluctant to enter your data into the program data files, we could take over that job. Please contact us to talk about possibilities. Or in case you have special wishes…. Publication:. 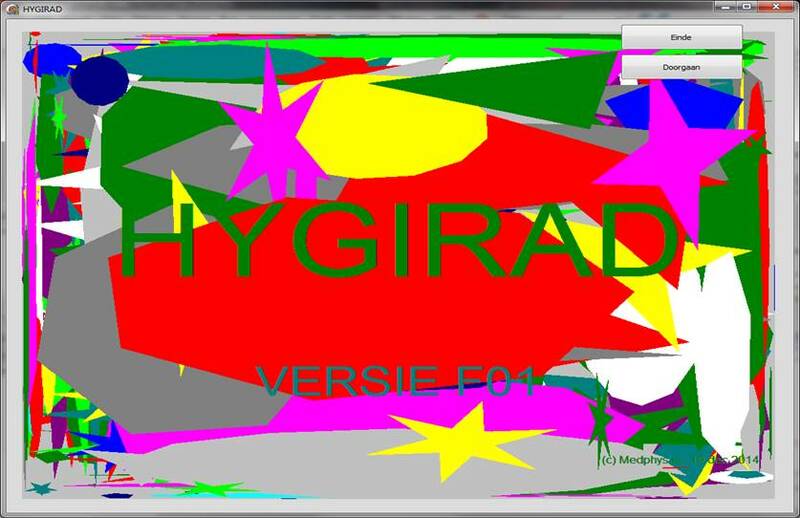 Hygirad Software: rekenhulp voor de klinisch fysicus.